Most women recognize 40 as a milestone….not a death sentence. OK now what she said makes sense. LOL. Queens, Bronx, you guys are on a 10 year voting probation. Well, 12 is one louder, isn’t it? Mixed nuts. Her and Maxine. Al’s prediction is as true today as it was when his movie came out, and it will remain just as true forever. Nigel Tufnel does not deserve this. Every time AOC watches the documentary we get another 12 years. Wow, I guess I missed a chapter in pop-culture. Needed to look this up! Actually she’s remarkably accomplished for someone functioning with only a brain stem. Yeah, that certainly could be AOC. 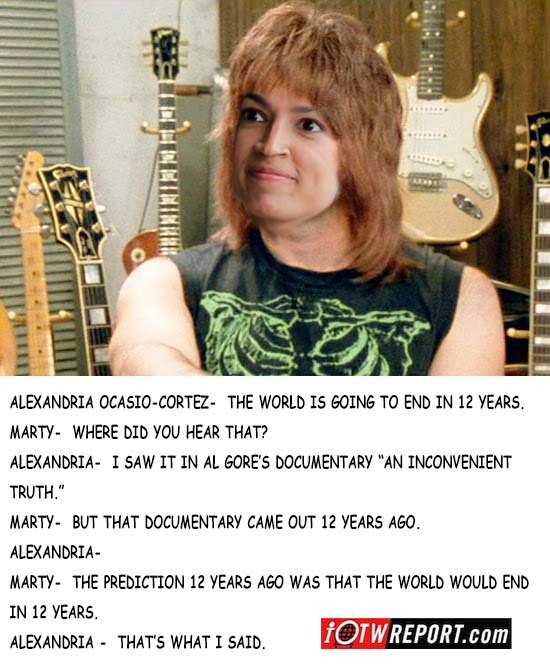 BTW AOC is a bit late coming to this party…Al Gore said the same poo too 12 years ago. @gin blossom, so is an alligator, I wouldn’t want one for a congressman. No gators in the Bronx but they have a whole lot of imbeciles. Hey Fur, where did you ever find a photo of AOC with her mouth CLOSED? BFH: it’s great to see more artwork from you. Please keep it up!! She only closes her mouth when she’s swallowing a fly. nuts, but she is nuts! Ocrazyo! Man, I love it! I’m going to call her that from now on! She also said, “All the top minds agree, Capitalism has an expiration date”. Top Minds? Must be some of the drunks she use to serve at the bar. I’m telling you all that this r-tard is the GOP’s secret weapon and they don’t even realize it yet. The democrats are going to be the one’s to shut her up. You watch!